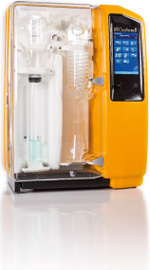 VAPODEST® is currently the most modern and powerful analysis system on the market for nitrogen analysis using the Kjeldahl method. VAPODEST® is also ideal for the steam distillation of volatile acids, sulphur dioxide, TVB-N, ammonium, formaldehyde, phenol, alcohol, vicinal diketones or hydrogen cyanide. The embedded PC ensures that it will also be possible to meet the increasingly complex requirements for data management in accredited laboratories in the future (DIN EN ISO/IEC 17025, GLP). VAPODEST® systems distinguish themselves by an excellent operation life. 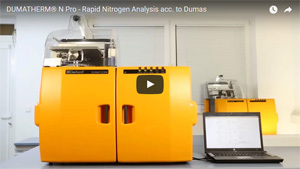 Precise pumps control the addition of reagents with maximum exactness. The steam pressure can be fully adjusted from 10 to 100 %. The unique, programmable "soft-start" function ensures controlled reactions. Analysis results achieved with VAPODEST® exceed the requirements of official international standards such as EN/ISO, AOAC, EPA, ASTM, GAFTA. VAPODEST® uses simple, modern operation, with menu navigation designed to resemble a tablet PC or smartphone. Data can be input using finger touch navigation or a stylus – or even laboratory gloves – via the 7-inch TFT full colour display. It is also possible to input data using a mouse and keyboard.